The Bats have finally been persuaded to bring their “Guilty Office” album release world tour to Dunedin after a stop-start tour that has seen them visit all the other New Zealand main centres and play to packed out crowds in the UK, in Europe, and more recently in Australia. Also sharing the bill with them are two other bands who have released critically acclaimed albums this year and have been touring recently. David Kilgour, backed by the Heavy 8s, recently released Falling Debris, his collaboration with poet Sam Hunt. He is rumoured to be working on new material for a more guitar-rock based album. The Bats frontman Robert Scott along with David Kilgour and brother Hamish Kilgour have also recently released the first album by The Clean in 8 years, “Mister Pop”, making this a particularly productive year for the musicians playing on the 7th. Haunted Love have also finally released their debut EP this year, the darkly beautiful “Heartbreak in Diamond City” and plan to follow it up with an album next year. They also contributed some haunted backing vocals to the Clean’s new album “Mister Pop” which brings some degree of connection to some of the other bands performing. The Puddle took 25 years to grow from the ugly duckling of Flying Nun pop into a moulting swan. Their latest album “The Shakespeare Monkey” was hyped as “the pinnacle of indie-pop in Aotearoa” by the overly enthusiastic Southland Times and their recent NZ tour found them a new generation of fans with perhaps uncharacteristically tight performances of both new and, for the first time in many years, old material. They also recorded an EP while they were on tour. The event will be an early start/ early finish too with the first band starting at 8:00 sharp and the night finishing around midnight. 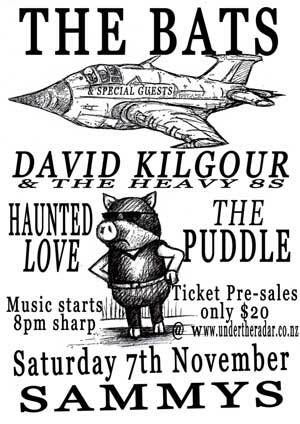 Tickets will be $20 and pre-sales via www.undertheradar.co.nz will get a free download of rare and unreleased songs.